If you’ve been keeping up with the Kardashians, you are familiar that Khloe Kardashian is dating Cleveland Cavalier cutie, Tristan Thompson. Late last week, news broke that Tristan has been sleeping with all the Instagram models in New York City while Khloe has been hiding in Cleveland, OH. 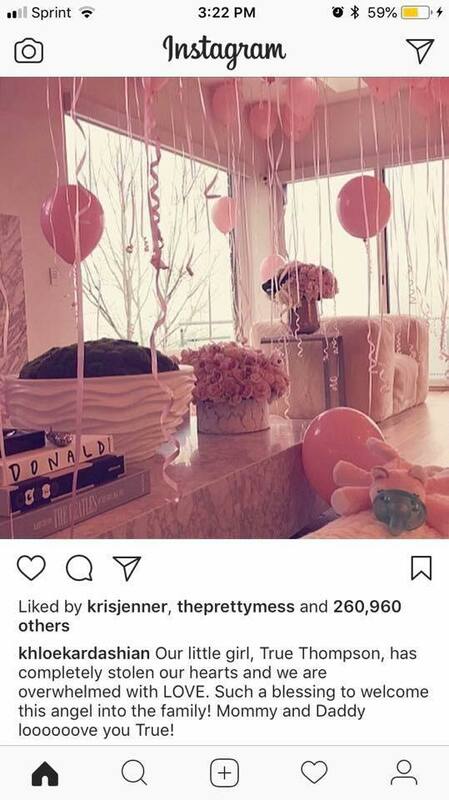 Shortly after the news of the scandal made waves, Kris Jenner flew to Cleveland and induced Khloe’s labor for damage control (I mean, the timing was just too perfect). She gave birth to a healthy baby girl and the drama surrounding Khloe and Tristan sort of died down over the weekend. On Monday afternoon, Khloe announced their daughter's name on Instagram and her name is…True. True Thompson. I really hope this wasn’t a last-minute decision when she was furious with Tristan's whereabouts because the jokes write themselves. First off, you can’t name your child something that its father is incapable of doing. Tristan’s Jamaican mother okayed this? My mom is Jamaican and when my sister wanted to name her daughter a unique name she intervenes immediately and strictly said, “not my grandchild.” And my oldest niece currently doesn’t have a weird name because my Jamaican mother is not about to walk around with a child with a name like True. I guess Khloe didn't want to answer the rumors herself so she named her daughter the answer to all the questions. Apparently True is a family name. Kris Jenner revealed on her Instagram two of her family members had True as a middle name. I can see it 10 years from now when True is in school with her cousins, Dream, Stormi, North, Chicago, Saint, Reign (I kid you not, that’s legit her cousins' names) and her classmates will make fun of her name. Classmate 1: I heard your daddy was stepping out on your momma right before you were born. Is that true? Classmate: I heard your daddy ain’t do that well as a basketball player after he got with your momma. Tristan was benched the first game in the playoffs and the Cavs lost. I told y’all the Kardashians were going to put a hex on the team. I will never forgive Tristan for doing this to Cleveland. I know LeBron is mean mugging Tristan during team meetings. Back in the day celebrities had cool weird names like Apple, Pilot Inspector, Audio Science, Rumer. They were odd but you knew a bunch of people wasn't going to start naming their kids' Diva Thin Muffin (that is in fact Frank Zappa's daughter's full name and she must hate him for all her body issues). I personally feel (and I could be wrong), the Kardashian/Jenners want to feel elite with the 'odd' celebrity baby names but the names all sound like what teens dream about naming their future kids. I'm sure one of us has said we wanted to name our child Stormi because it's cute, but we didn't actually do it once we were adults. The Kardashias are adults and they really went through and named their kids Saint. The only one whose name safe to walking around with the least effort at being “different” is Penelope. Penelope was always one of my favorite baby names and at least one child can look at her cousins and go, at least my name isn’t a forecast or direction. I'm dreading when True, Reign, Saint, Chicago, North all become popular baby names.